Del Rio Vineyards looks over Southern Oregon’s Rogue River between the Cascade and Siskiyou mountain ranges and located at Gold Hill, 15 miles northwest of Medford, Oregon in the beautiful Rogue River Valley. It’s sited on the 42nd parallel at an altitude of about 1,000 feet. Over 200 acres are planted to at least a dozen grape varieties including Nebbiolo, Malbec, Syrah, Sangiovese, Pinot Noir, Pinot Gris and others. A large number of wineries purchase grapes from Del Rio. 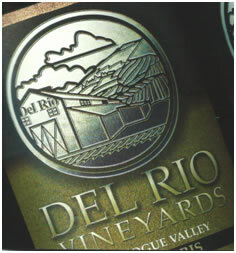 Del Rio has its own tasting room located near the vineyard in the historic Rock Point Stage Hotel built in 1865. The address is 52 North River Road, Gold Hill, OR.